At. Last. The great leap in smartphoning that all us schlubs have been waiting for is here. Point your phone at a wall to measure how wide it is, or choose a table on Wayfair and put it in your dining room to see how it works in the space. Hell, get lost in a mall and find your way out just by bringing your phone to eye level. Project Tango—the spatially aware camera setup from Google—is finally moving out of developers’ hands and reaching consumers. If you’re willing to be an early adopter, you can have access to a phone that manages to wedge in the multiple cameras needed to take advantage of Project Tango’s situationally aware magic. You’ll also get a massive 6.4-inch 1440p display, Snapdragon 652 processor (a processor strikingly similar to that in the Samsung Galaxy S7), and—oddly—Dolby Atmos playback capabilities and Dolby 5.1 recording capabilities. I’m hesitant to go hyperbolic, but smartphones have stagnated in the past several months. There’s been no real technological innovations to get you, me, or the average user excited about phones. Project Tango could change that. Some of the services it provides are small in the grand scheme of things: better VR and AR experiences, indoor navigation, and some of the coolest and most interactive games available. Yet all the possibilities Project Tango open up in a phone feel tremendously natural. After farting around with the Phab2 Pro, I found myself genuinely annoyed that my iPhone couldn’t measure a window with a wave or insert a dinosaur into the room. I’m not sure the Lenovo Phab2 Pro will be the perfect phone, but it’s the first one that’s piqued my geek senses in quite a while. It will be available in September for $500, both online and at Lowes (hey, it’s a handyman dream!) before rolling out to other retailers. 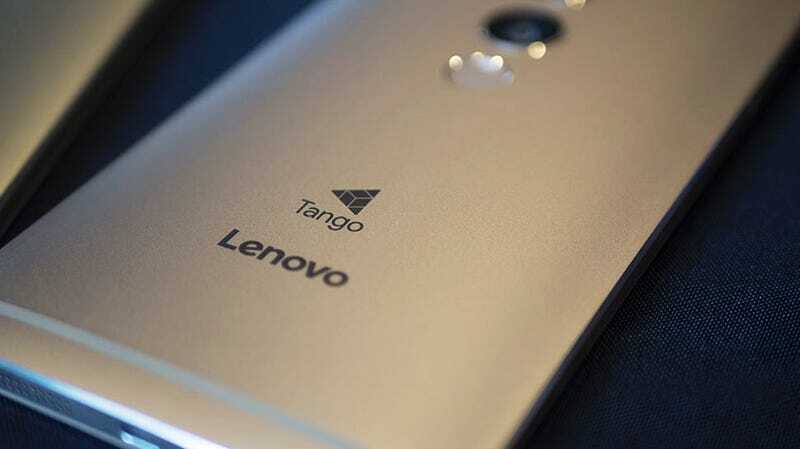 Lenovo will also be releasing Tango-free versions of the phone, the Phab2 and Phab2 Plus, for $200 and $300 respectively. But after witnessing the magic that Tango offers, I’m not sure why I’d blow my cash on something less impressive.